Korek Telecom is the third GSM operator in terms of the market coverage. It has about 6 million subscribers, i.e. about 15% of the mobile sector. Despite such modest figures compared to other mobile companies, the GSM-operator is becoming more popular. In the specialized forums, you can often find offers to provide Korek traffic for VoIP termination in Iraq. The operator is under the control of France Telecom. Its GSM covers more than 18 provinces of Iraq. 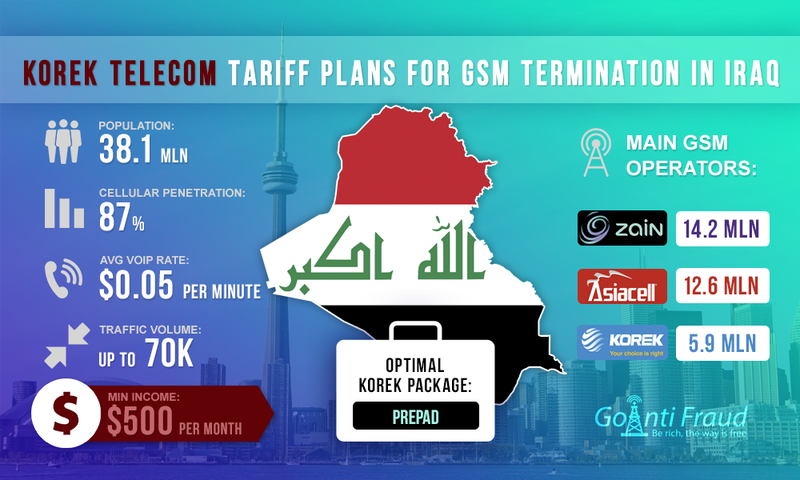 Korek Telecom offers only one prepaid package that is suitable for termination - PrePad. If you connect to it, one minute of conversation will cost as little as $0.0000730. To use this package, the subscriber will have to make an advance payment in the amount of $0.001189. In this case, the expense will include 1,500 minutes of calls within the network. After this limit is spent, the account can be replenished by the same amount again. The GSM traffic termination via PrePad is the most convenient and profitable. Do you want to increase the profitability of your business using China Skyline gateways? GoAntiFraud provides a complete solution for competitive VoIP GSM termination, due to which your GSM gateways and SIM-banks will operate more efficiently. We directly cooperate with China Skyline and sell its equipment at the lowest prices. No other GSM-operator in Iraq provides such conditions. In addition, when connected to the package, it is less likely that the cellular company will suspect termination because 1,500 minutes are supposed to be spent, using active communication within the network. And if you connect GoAntiFraud, then you will reduce the risks of SIM-block to a minimum. The average rate in Iraq is $0.05 per minute. Considering the above VoIP cost, the terminator can make about $500 a month. When you install multi-channel gateways, this number is multiplied by the number of ports. The only obstacle when connecting to PrePad is a condition statement: residence in Iraq or the citizenship of the country, and the availability of appropriate documents. But even under such circumstances, there is a way. On forums, there are common offers from local dealers to buy SIM-cards and install the VoIP-equipment in one country or another. GoAntiFraud is compatible with the equipment produced by EjoinTech & China Skyline. You can connect your gateways and SIM-banks to the service, or buy equipment from us at a low price. For those who are just starting a GSM termination business, we offer ready NewBusiness packages, including complete sets of Ejoin Tech & China Skyline equipment.